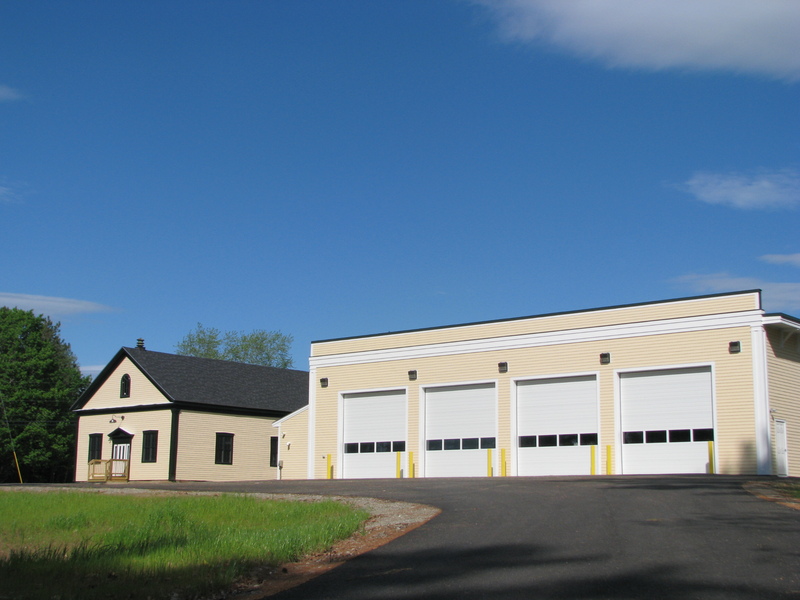 New Station #2 and Pownalborough Hall are now OPEN!!!! September 2009 – The new station was opened. It now houses three Engines, Tank 4, Rescue 2, a Brush Truck and our Rescue Boat. We thank the town for supporting our department by providing our department with a new station to properly serve our community. Anyone who is interested in seeing the station may stop by for a tour of the new facility. Engine 3 continues to be housed at Station #1 (Jewett Station) at Dresden Mills because of that station’s proximity to Route 27 and structures on the northern portions of the town. The reduced response time at that end of town was recently demonstrated at a house fire on Route 27, when Engine 3 was the first on scene and was putting water on the fire several minutes before the next fire apparatus arrived. March 2009 – Dresden’s Board of Selectmen last August chose the team of Lajoie Bros., Inc., general contractors of Augusta (http://www.lajoiebros.com) , and Whipple-Callender Architects of Portland (http://www.whipplecallender.com) to design and construct the new four double-bay fire station at Pownalborough and to make exterior renovations to Pownalborough Hall. This team was selected from 12 teams which submitted letters of interest, of which four were interviewed by an advisory committee working with the selectmen. The team worked for several weeks with the Selectmen on what is known as a design-build method of construction. This means that, starting with a general concept of the new station as approved at town meeting last year, the team and the Selectmen came up with a final design in all its details. The benefit of this method of construction is that it can save time by allowing basic construction to begin even before all the details of the design have been finalized. It is also often a less expensive method, and it gives the town more control over the end product. Work on the foundation for the new structure will begin this spring. The Selectmen have set a deadline for a September 2009 completion. G’day from Down Under, I have a mystery Dresden F D patch in my collection oh U.S. fire dept patches, show a bridge, would this be from your fire dept in ME???? I don’t believe the patch is from Dresden, Maine. Our town’s emblem shows an eagle, a fish and a pine tree. It might be that of Dresden, NY, Dresden, Ohio, or another Dresden. There is a Dresden in Ontario, Canada. That is a nice new station….. i miss the Dresden Fire and all the people that was there with me, and my old truck ENG #3!! Nice to hear from you. When were you at DFD? I’ve been assigned to Engine 3 since 2008. Nice to meet ya, I was there for many years. I started on the Junior Fire fighter program and stayed until 1998. I miss the town and the people along with the good times we had there. I had left to work in augusta and had moved to Gardiner, so couldnt keep doing it. Not sure who is till there but mention my name to steve lilly he will tell you about me. The building looks really great and cool! The fire and rescue team deserve this building. They are saving the lives of the many so they really deserve to be given a proper attention. Heads up to our fire and rescue team! Thank you for taking the time to check out our website and for the very nice comment. Like many others, this is a work in progress and I hope to be able to keep it as up to date as I can.